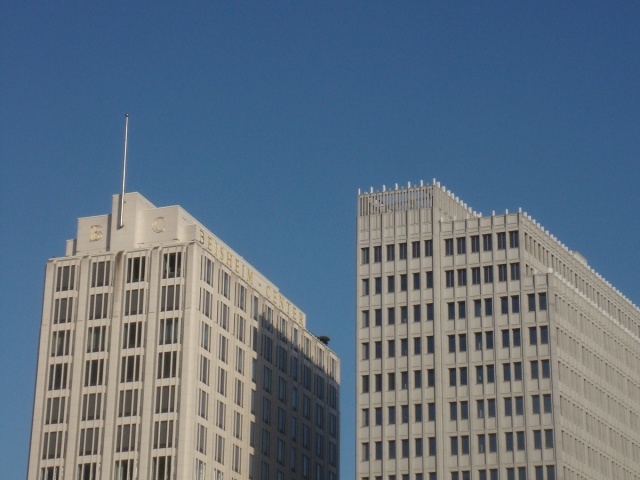 First thing I think one should know about Potsdamer Platz is of course its history. Before the Second World War, the Potsdamer Platz was one of the busiest traffic intersections in Europe – if not the busiest. In the twenties, one of the first traffic lights and actually the first electrical traffic light of Europe was erected on Potsdamer Platz. It is hard to imagine, but from 1961 through 1989 the Berlin Wall went right through Potsdamer Platz. 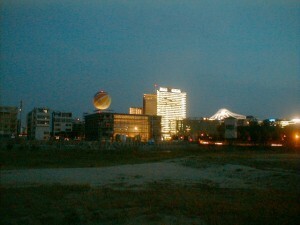 During the 70ies on both West- and East Side almost all buildings near Potzdamer Platz were torn down. With the death stripe on the East side and dead end streets on the West side the area soon became some sort of wasteland. Some scenes of Wim Wenders’ movie ‘Himmel über Berlin‘ are are set at Potsdamer Platz, showing the hopelessness of these ‘wastelands’ during the late 80ies (DVD / stream at amazon.com). In the eighties on the West Side a test track for a magnetic monorail train was built. Besides the tracks for the monorail there were a couple of fast food stands, a ‘circled wagon train’ and some viewing platforms with a view over the Wall – to the East side. And in the late 70ies, early 80ies plans to build an Autobahn parallel to the Berlin Wall were developed. These plans were dropped only after the Fall of the Wall. 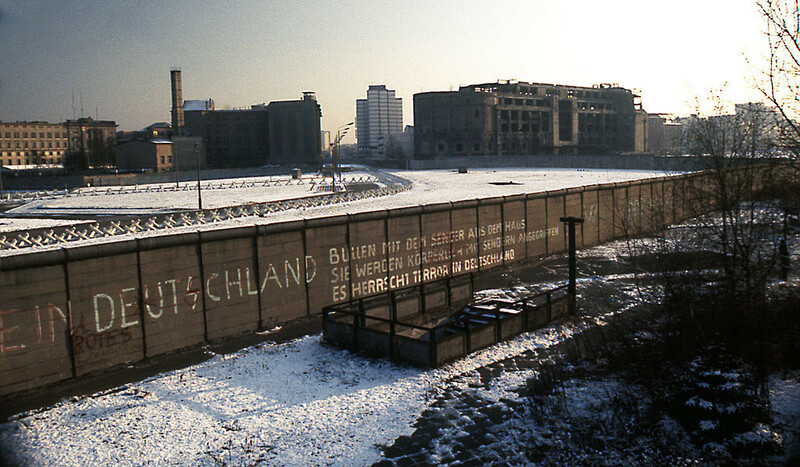 Today nothing of this hopelessness or the ‘wastelands’ is left – but you can actually see some original pieces of the Wall near S-Bahn station Potsdamer Platz / Ebertstrasse. 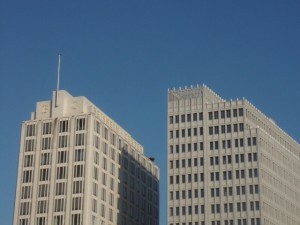 The Potsdamer Platz basically consists of two – maybe three major areas. First, on the Tiergarten-Side Potsdamer Strasse: the Sony Center with its iconic Mount-Fuji-insipred glass roof and the glass tower aka Bahn Tower. Second: the buildings on the opposite side of Potsdamer Strasse, including the theater at Marlene Dietrich Platz, the Shopping Mall “Potsdamer Platz Arkaden”, a collection of buildings designed by various world famous architect and the historical building ‘Haus Huth’ as well as the Kollhoff-Tower. 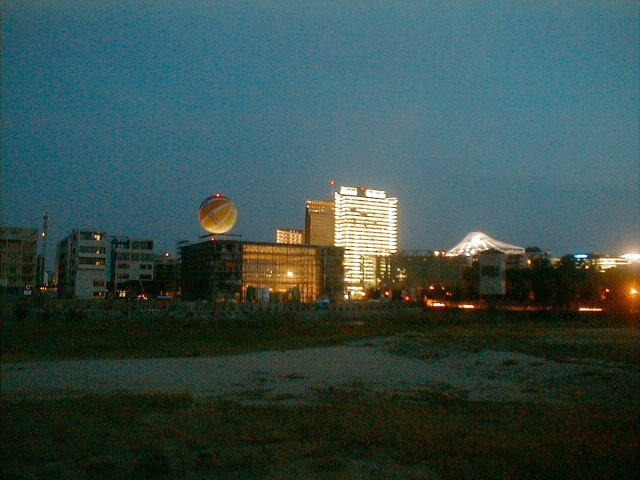 And third: the buildings called ‘Beisheim Center’ next to the Sony Center. 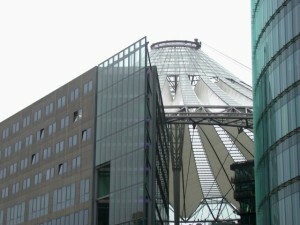 The Sony Center is a landmark. Probably the most impressive details of the trangle shaped complex is the tent-like roof, inspired by Japan’s Mount Fuji, covering a round square. Around that square a number of cafés and restaurants are located – but also the movie theaters CineStar and IMAX and other film institutions are located here: The Deutsche Kinemathek – Museum für Film und Fernsehen (German Film and TV Museum), the Filmhaus, the Deutsche Film- und Fernsehakademie Berlin dffb (the German Film and Television Academy Berlin) and another movie theater specialized on historical films Arsenal are located all in Sony Center. The Beisheim Center is a group of buildings, built by German-Swiss businessman (and founder of Metro AG) Otto Beisheim. The Beisheim Center is located on the so called Lenné-Triangle. To me the buildings of Beisheim Center look like a group of ‘cut-off top floors’ of American-style skyscrapers – or as if skyscrapers were bug into the ground and only the top floors were sticking out. But I guess that was originally intended by the architect. On the grounds of Beisheim Center two 5-star hotels can be found: the Ritz-Carlton Berlin and the Berlin Marriott. During the International Berlin Film Festival Berlinale film stars like to stay in one of the two hotels since they are located so close to the main festival grounds. Nineteen buildings, ten streets, two public squares – that’s the Quartier Potsdamer Platz right opposite of Sony Center, across the ‘Boulevard of Stars’. 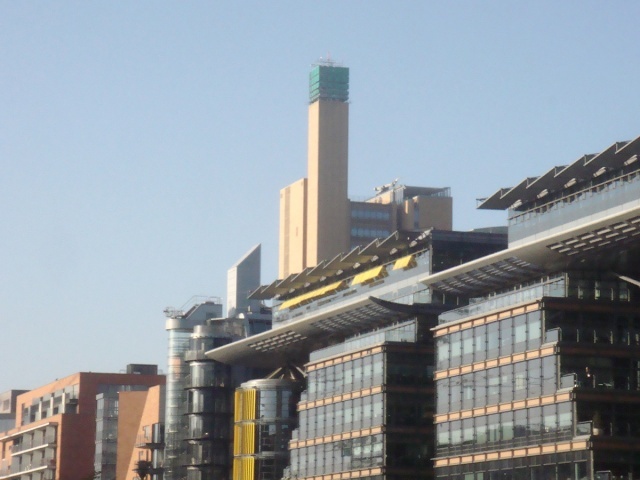 The 550.000 square meters area features two hotels, a cinema, three theaters, a casino, the shopping mall Potsdamer Platz Arkaden with more than 130 shops and around 30 restaurants, bars and cafés, offices and of course both rental apartments and condominiums. Once a year Marlene-Dietrich-Platz is covered in red and a giant disco ball is hanging from the ceiling of the theater at Marlene-Dietrich-Platz 1. This is basically the headquarter of the International Berlin Film Festival Berlinale – this is where the big pictures are shown and where the stars walk the carpet. You can either experience the architecture directly by roaming through the streets between the different buildings, or have look at the buildings from a distance. The park right next to Quartier Potsdamer Platz provides a great view on the facades – and you can also sit on the lawn of Tilla-Durieux-Park. 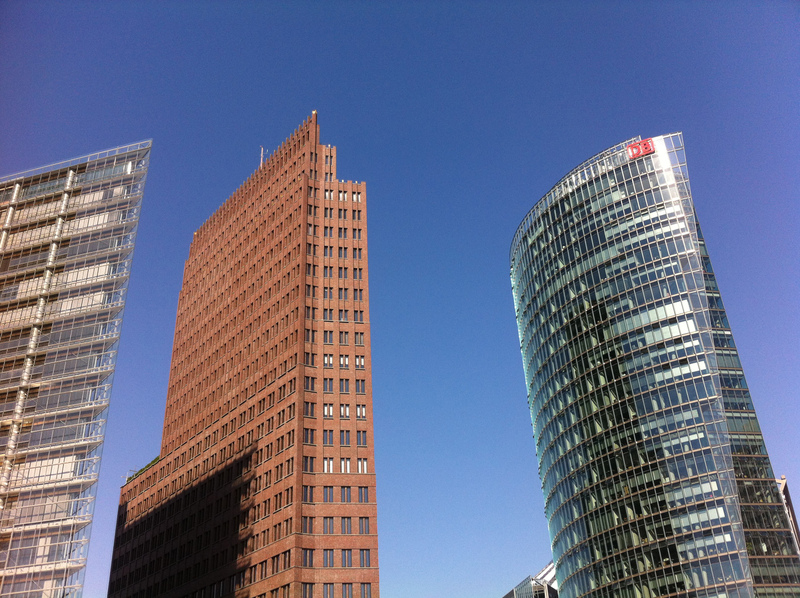 At 24th and 25 floor of the brick covered Kollhoff-Tower, Potsdamer Platz 1, you’ll find the observation deck “Panoramapunkt”. For further information see also the page about Berlin Observation Decks and Platforms. U-Bahn: take the U-Bahn U2 to S+U station Potsdamer Platz. S-Bahn: take the S-Bahn S1, S2 or S25 to S+U station Potsdamer Platz.